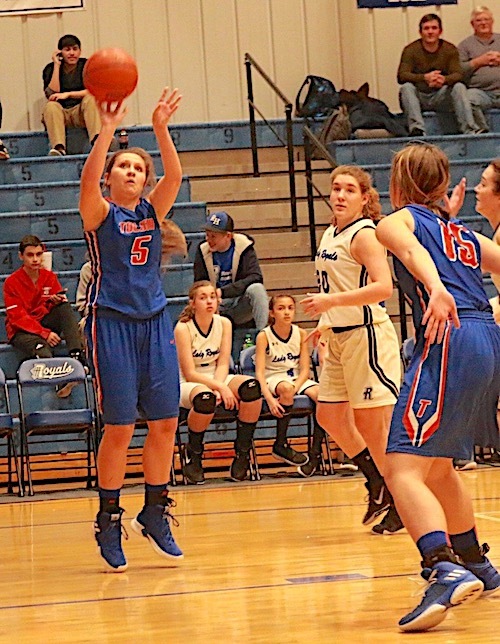 ASHLAND, KY. — Tolsia Lady Rebels ( 1-0 ) pulled away after a very sluggish first quarter for a 65-28 road victory over Rose Hill ( 1-3 ) on Tuesday night at Charles E. Stewart gymnasium. Selena Browning also hit double figures with 11 points, Sophomore Julie Boone finished with 5 points and a team high 14 rebounds, Freshman Lynndsey Cassell making her high school debut tallied 6 points and had 8 steals, Sophomore Kenzie Young scored 5 points, Sophomore Becca Castle 4 points, Sophomore Kylea Pollinger hit a three pointer, Junior Trinity Muncy, Sophomore Elizabeth Johnson, Sophomore Jace Litton, Sophomore Isabella Simpkins, and Freshman Hayley Collie had 2 points each. Tolsia and Rose Hill were tied at 11 before the Lady Rebels took a 32-20 lead at Halftime.In the second half it was all Tolsia after a 23-6 advantage in the third period. THS hit three pointers and went 10-19 from the line. Rose Hill went 20-43 from the free throw line and only made 4 baskets for the entire game. Tolsia will play Grace Christian in the 18th BJM/Key Player Shootout Friday night at Rebel Arena. Cameron and Tug Valley will play the first game. Consolation game will be 5:00 Saturday and Championship game will be at 7:00. Rose Hill will travel to Fairview Friday night. Sophomore Selena Browning with the short jumper against Rose Hill.